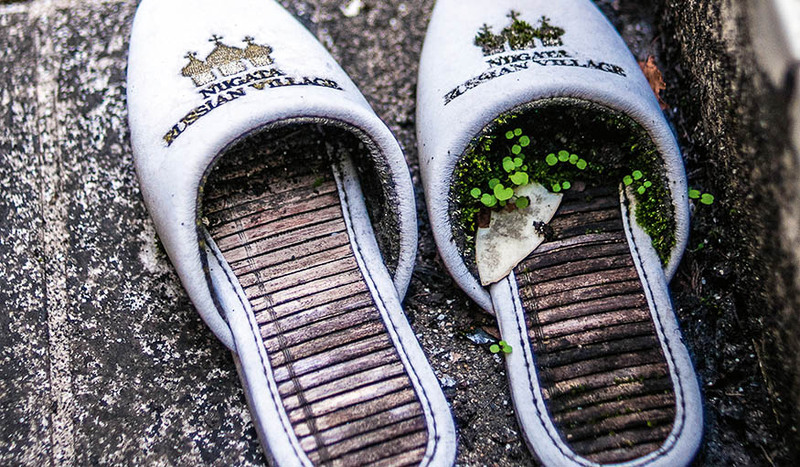 The eerily vacant theme park, Niigata Russian Village, six hours from Tokyo. The remnants of Niigata Russian Village, six hours from Tokyo. Sanjay Fernandes finds himself in an eerily vacant theme park six hours from Tokyo. The sun has well and truly set in the Niigata countryside. It’s so dark that the only way I can be sure of the rolling paddocks on either side of us is the odd occasion our high-beams stretch out beyond the curves of the road. The dim streetlights reveal vast stretches of rice fields on either side of the road. Having left Tokyo earlier in the day, we’ve travelled from one of the most crowded spaces in the country to one of the most isolated – and right now it definitely feels like it. At about 9.30pm my three friends and I arrive at our final destination: the Gozu Mountain Range. A local we’d met in a bar in Tokyo told us, in his broken English, that there were replicas of Russian Orthodox churches, cossack mannequins, and life-sized stuffed woolly mammoths at an interesting ‘theme’ park nestled atop one of the mountain range’s very first peaks. According to the local it was well worth the six-hour drive. The Niigata Russian Village was opened in 1999 to ‘boost cultural exchange’ between Japan and Russia. A state-of-the-art theatre (which hosted performances by dance companies from Vladivostok and Khabarovsk), a replica of the Cathedral of the Nativity in Suzdal from the 13th Century, and a hot air balloon that hovered 150 metres above the ground offering views of the surrounding hills and plains, were just some of the grandiose inclusions. As we drive into the mountain range the silhouette of the Russian cathedral against the night sky is a dramatic welcome. The narrow driveway snaking up the mountain is indistinguishable from the surrounding jungle, the vines on either side of the road growing across the asphalt have created the mountain’s very own green carpet. Reaching a rusted gate that is half ajar, we exchange nervous looks – the car won’t fit through the gate so one of us has to get out…. We’re here and filled with a mixture of excitement and dread. Why dread? Well, it’s not the promise of Russian culture that’s drawn us here. This theme park is one of many sites across Japan that has been built, abandoned and left to decay. In fact, Niigata Russian Village was deserted only six months after it was completed. These places are known as ‘haikyo’ (meaning abandoned place) and have grown in numbers over the last three decades. Since World War II the Japanese government has adopted a strange economic policy that has aimed to boost employment in regional areas. They commission large-scale developments in isolated regions of Japan. Then as time passes it’s realised that the population to support the investment just isn’t there – so the easiest option is to abandon the site. On one eastern peninsula on Honshu there’s a jungle theme park, home to a greenhouse that covers 10,000 square metres. There’s Ceramic Land, which was built to mimic the beauty and symmetry of the Gardens of Versailles and the Louvre Palace, in the Middle-Of-Nowhere,Nagasaki. There are abandoned love hotels in the countryside, replete with ‘space ship’ or ‘underwater’ rooms –Japan’s answer to a western-style B&B. It’s perhaps fitting, if not a little ironic, that one haikyo is a cement factory lying in ruins, rusted machinery and all. These abandoned playgrounds are dotted all over Japan, which has led to a growing interest in urban exploring. It’s not that these places are bustling tourist hubs – in fact, there’s not a soul around when we arrive at Niigata Russian Village late at night. 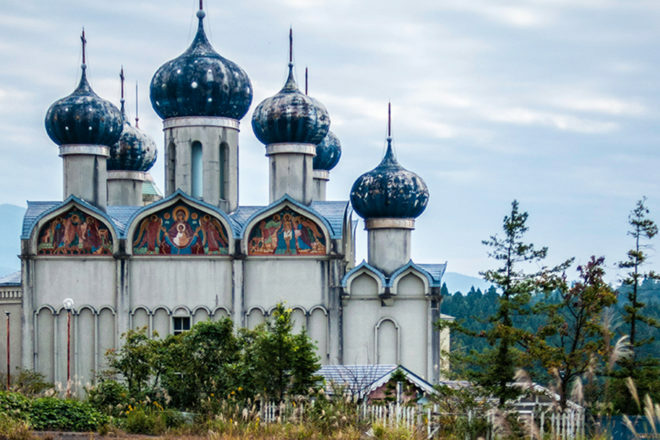 Niigata Russian Village is a plethora of towering cathedrals, turnstiles and Russian signs that taunt us rather than welcome us. With torches in hand we shuffle through the entrance arches and enter a dark corridor lined with smashed windows. Winding in and out of the windowpanes are weed-like creepers, escorting us through the halls like a guard of honour. It’s about as much as our nerves can take tonight. We leave the maze of corridors and set up camp a safe distance from the village in the wide, open space of the car park. The next morning we wake up to quite a sight. The colourful frescos of cathedral towers are still vivid, despite being left in disrepair for over a decade. Our fear turns into awe – and exploring the haikyo in the light of day is much more fun. Retracing our steps, the empty corridors now reveal vacant office space. Landline phones, a supply of hotel slippers, and account books are all strewn across desks. We see a staircase and decide to keep exploring, finding another 60 or so hotel rooms. Nearly all of them have been vandalised and some of the room’s tables, chairs and bed frames have been thrown through the windows. They now lie shattered in the courtyard below. The centrepiece of the theme park, a Russian church fitted with pews, an altar and a large organ, lies directly opposite the ‘hotel’. Once the venue for Japanese weddings (Japanese do love the quirk factor) it has lost its magic, but the organ still works and we hammer out classics like ‘Mary Had a Little Lamb’ and ‘Twinkle Twinkle Little Star’. Needless to say, the acoustics in the cathedral are nearly as bad as our singing. The adrenalin from the previous night has all but faded. The whole experience is now more comical than spooky. The Niigata Russian Village is bizarre in every way; the detailed design, the location. Most haikyo are built as novelties and once they’re abandoned it’s the novelty that brings visitors, while everything else deteriorates. Our overnight stay in this adult playground delivered the fear, joy and amusement in a way that no fully operational theme park could.